The power of the neighborhood slice shop. 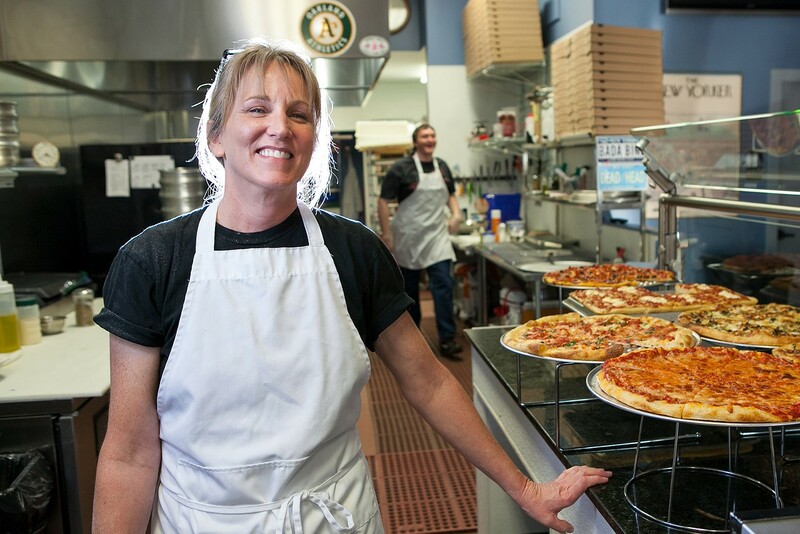 Bluebird's Fran Leidy and her East Coast-style pies. Hours: Tue.-Thu. 4–8 p.m., Fri.–Sat. 4–9 p.m., Sun. 2–8 p.m. Most importantly, the restaurant serves East Coast-style pizza that's good enough for this New Jersey transplant to make a special trip. Like so many standard-bearers for transplanted regional American foods, Bluebird was born of necessity. 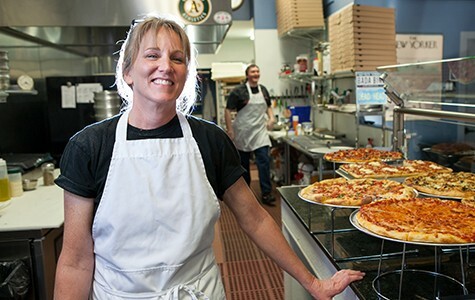 Leidy — a self-taught pizza cook who hails from Ocean County, New Jersey — has lived in San Leandro for fifteen years, and she said friends visiting from New Jersey would never believe her when she told them there wasn't any place to go grab a slice. 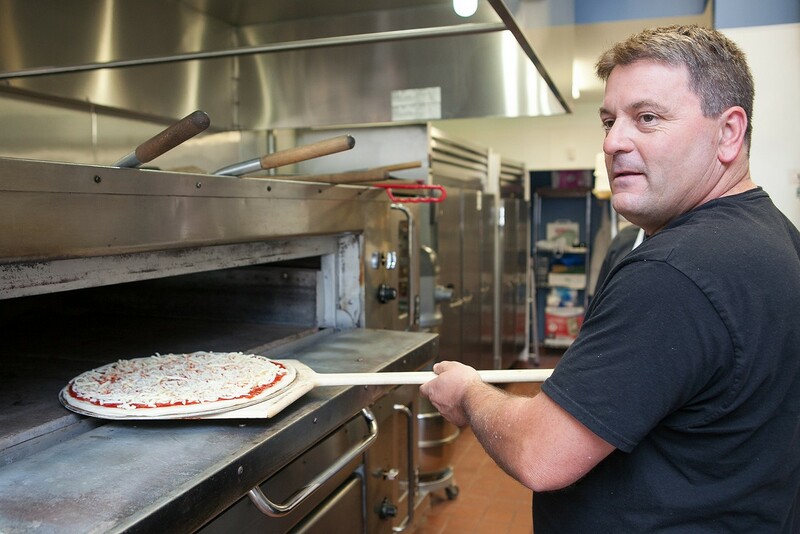 Bluebird has employees who work the cash register and slide the pizzas into the gas deck oven, but Leidy alone presides over the long-fermented dough. All night long she works it, tossing each soft and stretchy ball with her fingertips until it's just the right size. 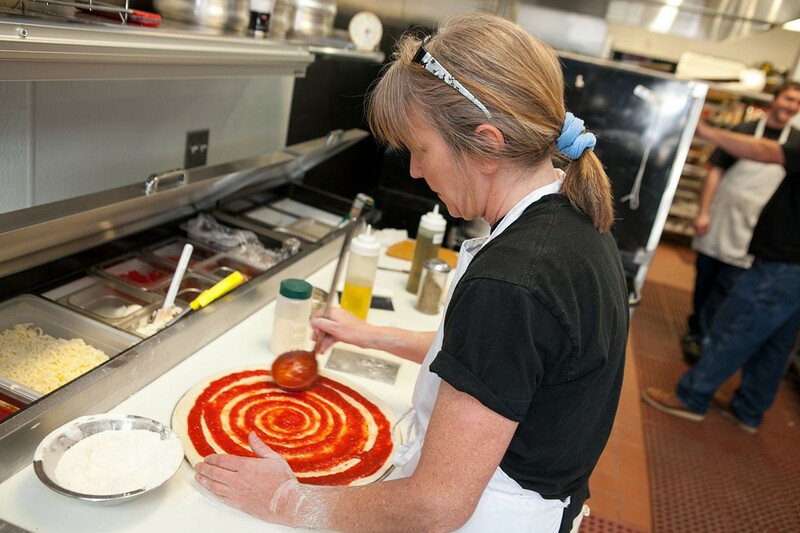 The dough is one of the great secrets to the pizza's success. Bluebird serves East Coast pizza, though purists might quibble that the restaurant strays from some of the defining characteristics of the classic New York style. Leidy's pies are medium-thick, crunchy-bottomed, and pleasantly soft and chewy. You can fold a slice in half if you want to, but it's not the kind of thin, floppy pizza that New Yorkers generally hold up as the gold standard. What definitely is New York-style is the sauce, which Leidy makes with 7/11 brand crushed tomatoes that she seasons with ground fennel seeds and other spices. The result is a sauce with a tangy sweetness that you'll immediately recognize if you grew up eating pizza on the East Coast. Generally speaking, Bluebird doesn't offer the kind of frou-frou toppings favored by Cal-Italian pizza restaurants, but the quality is still a cut above — e.g., Fra' Mani sopressata and organic broccoli. My favorite from the short list of pre-set combinations was the "combo" pie, which came topped with sausage, pepperoni, olives, and thinly sliced Peppadews (sweet marinated peppers). Each slice of pepperoni curled into a little self-contained cup of gloriously decadent pepperoni grease, with the Peppadews adding an occasional burst of sweetness to balance the richness. Bluebird also makes a respectable version of a "Hawaiian" pizza, substituting pepperoni for the standard ham and adding sliced jalapeños — savoriness and heat to balance out the sweetness of the sliced pineapple. These are pizzas meant to be scarfed down with relish, not analyzed. In each case, though, the deeply flavorful New York-style sauce and the crust, with its abundant textural pleasures, stole the show. Because Leidy makes each pizza to order, it takes a good twenty minutes for your pie to come out (longer if the restaurant is slammed), and you'll probably want something to munch on while you wait. When Leidy has time to put one together, there might be a salad, served with a slab of house-baked focaccia bread. During one visit, that salad consisted of lettuce, olives, carrots, thick shreds of mozzarella, and a house-made balsamic vinaigrette — the kind of unvarnished, nominally "Italian" salad that befits a proper pizza shop. Really, though, the best appetizer to snack on while your pizza bakes is, well, more pizza. 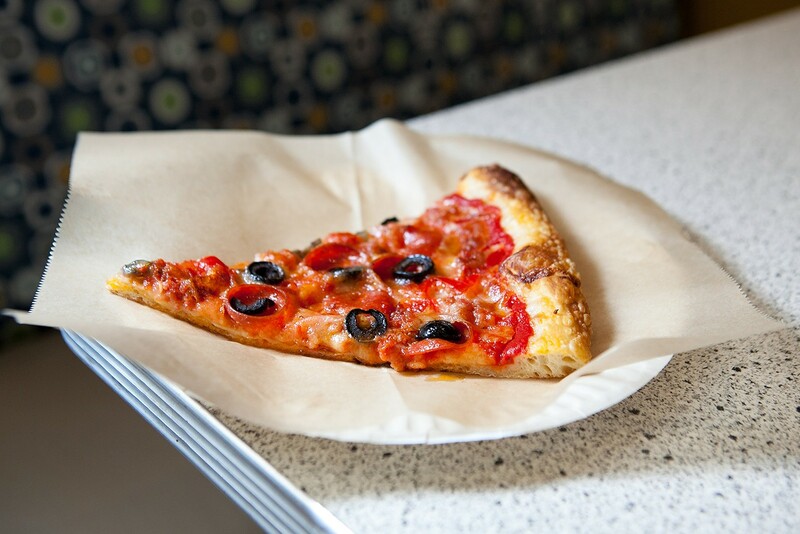 There are almost always several by-the-slice options set out on the display counter, perfect for solo diners or the cranky toddler who needs to eat right now. I tended to home in on the rectangular "grandma" slices, a rustic style that's relatively hard to find outside of New York. For these, Leidy stretches her dough into an olive-oil covered square pan so that the resulting crust puffs up like a Sicilian pizza or the Ellio's frozen variety you might have eaten as a kid. Behold, pizza nirvana: a thick crust that's crunchy on the bottom and soft and chewy on top, and cheese that crisps and caramelizes all around the edges. One night the grandma pie was topped with fontina cheese, charred scallions, and crispy sausage bits; another version featured tomato sauce, fresh mozzarella, and dried herbs. Both were straight-up delicious. I never had a bad pizza at Bluebird, but if compelled to pick a weakest link I'd nominate the basil-and-fresh-mozzarella-topped margherita. The tomato sauce was a bit watery and lacked the oomph of Leidy's more flavorful New York-style red sauce — and I think a traditional Neapolitan thin-crust pizza fired in a wood oven works better with these particular toppings. Instead, consider ordering the white pizza, another East Coast staple, which replaces the tomato sauce with a white sauce that consists of garlic, olive oil, ricotta cheese, and cream. The slice I tried had a hint of spinach, too, and was coated with a generous slick of grease that my dining companion started to dab at with a napkin. Resist the temptation: The garlicky oil is worth the cholesterol. Part of what's refreshing about Bluebird is how down-to-earth it is — how no one puts on airs, and the quality of the food speaks for itself. But it's also the kind of place where beverage options include bottles of semi-fancy Boylan sodas, and desserts include homemade chocolate chip cookies and generous scoops of Three Twins organic ice cream. During my visits, Bluebird was always packed with folks from the neighborhood — families with kids picking up a couple of pies after soccer practice, construction workers stopping in at the end of a long day. Everyone kept running into someone they knew. I lost count of how many free slices Leidy and her husband Ray handed out — and of how many regulars they greeted by name. This is the power of a neighborhood slice shop. It's something those of us from the East Coast have missed for too long.